What transpires in the first five minutes of René Clément’s Forbidden Games is probably the most depressing thing to ever happen in a movie—even a French one. It’s June, 1940, and the people of Paris are scrambling away from the city amid a flurry of Nazi bombs. Among them is young Paulette (Brigitte Fossey), who exposes herself to machine-gun fire as she innocently sprints across a bridge to retrieve an adorable puppy that has scampered off. The girl’s horrified parents naturally chase after their daughter. A German plane strafes overhead, and only Paulette survives—not even her dog is spared, its small legs twitching to a slow stop. The movie is clearly not interested in sugarcoating or sentimentalizing WWII, even though Clément has every opportunity to do so. 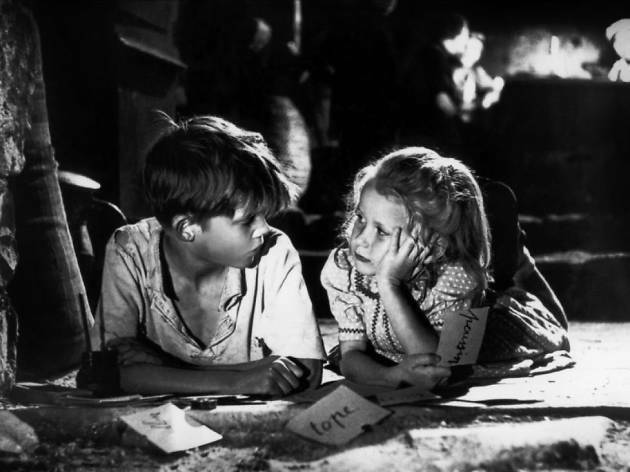 A film about children that is most definitely not a children’s film, this enduring minor classic follows the orphaned Paulette as she wanders onto a rustic farm in the countryside and makes friends with a boy named Michel (Georges Poujouly). The pair obsessively busy themselves building a cemetery for all the little things the war has left in its wake (Paulette’s dog, a broken plate), thus creating a bubble in which they can make their own sense of the horror that brought them together. First shot as a short before Clément extended it into a feature, Forbidden Games fails to fully disguise its padding, and it tends to suffer when the adult world comes to the fore. Any quibbles, however, are smoothed out by the director’s flat approach to life during wartime, which regards the black cloud of death with the ordinariness of all weather. If war is a fist closing on a raw egg, Clément’s unforced levity—and the natural, heartbreaking aloofness of Fossey’s indelible performance—allows the film to find a terrible beauty in the yolk that slips through its fingers.